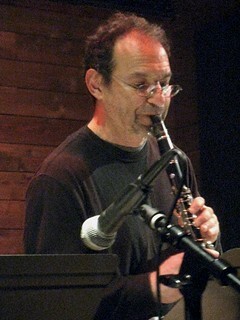 Clarinetist Ben Goldberg has been active for over 30 years, founding the New Klezmer Trio, and playing with the proverbial who’s who of modern creative jazz. My understanding is that you started your musical career playing jazz and klezmer. How did you make a transition to the more avant-garde material that you’re known for today? Well, I was raised as a real old-fashioned Modernist. In English class I would always skip to the back of the poetry textbook to check out the Cummings and Eliot (they were as far as textbooks got back then). In Jr. High when we got the Smithsonian Classic Jazz collection at home I knew my real work was to understand how the first 11 sides led up to Ornette Coleman and Cecil Taylor. My idea of the avant garde was that it grew out of traditional knowledge. One thing that fascinated me about Steve Lacy was that he was steeped in early jazz and Monk. So I saw my task as learning everything I could about music to prepare for inventing something new. The New Klezmer Trio was a precursor, in a way, for John Zorn’s Masada and other groups that are recording in that tradition. Would you call yourself an influence on Mr. Zorn, the other way around, or a little of both? John was an important model for me, as he was for so many, in the intensity of his belief in, and commitment to, creating something new and staying with it! As to the other part of your question, we will have to ask Mr. Zorn. Are you familiar with the work of Ivo Papasov? If so, how would you compare yourself to him? That guy can really play the clarinet! Is the New Klezmer Trio defunct at this point? Well, I’m no longer using that name but the project of Jewish – based music played by a trio of clarinet, bass, and drums is alive for me. I’ve been touring with Kenny and Greg Cohen (and we released Speech Communication in 2009), and on Thursday this week Greg and Ben Perowsky and I will play at the Stone. This kind of improvisational klezmer music is where I first found musical freedom, and that feeling of spaciousness and open-ended possibility is very important to me. Your musical direction continues to evolve. What led you to the approaches taken on Unfold Ordinary Mind and Subatomic Particle Homesick Blues? Well, music is always evolving and I never know where it will take me next. And I am always happy to find out. It is well documented that Steve Lacy was a major influence on you in your early career. Is that still the case now? The things I learned, and continue to learn, from Mr. Lacy and his music are at the heart of everything I do. I had one meeting with him that changed my life. Last week I played a piece from Hocus Pocus in a solo clarinet concert in San Francisco, and in June the pianist Michael Coleman and I will attempt an entire set of this material in a tribute concert that Larry Ochs organized. I was pleased when you joined up with Tin Hat Trio, as they were always one of those great uncategorizable groups. Any plans to continue recording or touring with them? It’s a little sporadic at the moment. But I am still very happy with the record we made of songs based on E E Cummings poems, The Rain Is A Handsome Animal. In a lot of ways, New York is the center of avant-jazz these days. Does this result in any pros or cons for you, a west coast guy? Steve Lacy once told me “your own living room can become the jazz center of the universe.” Of course, sometimes it’s a good idea to step out of your living room and spend some time in New York! Which I have been doing a lot more of recently. Clarinet is a popular instrument with kids in grade school, but seems to get eclipsed by other instruments (e.g., sax, guitar…) as the kids grow up. Any words of encouragement to young people playing the instrument? Stop while you can! Actually, stop IF you can — the sister- and brotherhood of clarinetists seems to consist of those of us who couldn’t stop no matter what. That’s why it’s so full of interesting and mysterious cats. What do you have coming up in 2014? We made a wonderful recording of my song-cycle Orphic Machine that will be released this year. Also two trio records, a lovely one with Scott Amendola and the guitarist John Dieterich from Deerhoof, and a cool and very weird record of Thelonious Monk songs with Adam Levy and Smith Dobson will come out, along with the first record by my group Ben Goldberg School. Also some touring by my duo with Myra Melford, the trio with Greg and Kenny, and with Unfold Ordinary Mind. Hey — you can hear all those groups at the Stone this week! It has been a while since I wrote one of these general update posts. Nothing earth-shattering is going on in the world of AMN, but a few tidbits that you might be interested in. I just finished updating the geographical listing of live music venues on out Live Music page. This is our attempt to provide an idea of where to go to hear all kinds of strange and wonderful tunes. It is obviously incomplete, but it is a constant work in progress. Drop us a line if we’re missing a venue you know of. Our reviews keep chugging along, and I’m shooting for 10-15 per month in the future. One of our biggest problems (and it is a good one to have) is that we get far more promo material to review than we possibly can listen to, much less review. Our review staff keep plugging along with great effort, but if you or anyone you know would like to help out, have them contact me. One of the pleasant surprises of the last year has been the popularity of our interviews. They have been some of the most-visited places on the entire site, and we only starting conducting interviews six months ago. Many of our interviewees have gone to great effort to provide very detailed answers to our questions. We have several more in the hopper, and hope to eventually provide five or more per month. That’s all for now. Happy listening. New Music Edmonton is thankfully dedicated to keeping the cause of new music alive, although of necessity on a smaller scale. On Friday they brought to the Muttart Hall the Montreal-based Ensemble Transmission, a six-member chamber ensemble who are currently on their first tour of Western Canada. This concert, though, turned out to be not cutting edge, but a kind of throwback to a certain kind of chamber ensemble music of the avant-garde period of the 1960s and 1970s. We are proud to present pioneering music legend Fred Frith for the first time ever in Detroit, in an evening of solo performance. 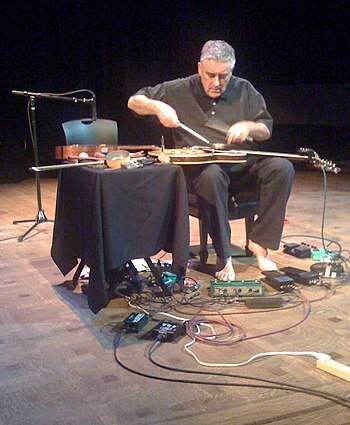 With a career spanning 5 decades, Fred Frith has covered more sonic territory than almost anyone alive. Free improvisation, chamber music, bedroom casio-pop, abstract extended-technique solo works, folkloric tunes, electronic music and rock of various types have all been part of Frith’s sound-world for decades- evidenced on his solo records and recordings with people like Brian Eno, Robert Wyatt, Ikue Mori, Derek Bailey, Jad Fair, Zeena Parkins and Tom Cora. Mr. Haas’s works are rooted in microtonality — a system that divides the conventional scale of Western classical music into many more than its usual 12 semitone pitches. (His opera “Thomas” incorporates some 1,600 different pitches.) In Europe, composers like Ligeti and Penderecki used microtones; American composers including Charles Ives, Harry Partch and La Monte Young have also breached the standard division of the octave. In Mr. Haas’s scores, these microtones result in opulent and otherworldly harmonies that at times seem impossible to have been produced by acoustic instruments.